On April 24, 1990, Hubble Space Telescope was launched into low Earth orbit from space shuttle Discovery (STS-31). It orbits the Earth at an altitude of about 350 miles (560 kilometers). For a comparison, the International Space Station (ISS) maintains an orbit with an altitude of between 205 and 270 miles (330 and 435 kilometers). The telescope is 43.5 feet (13.2 meters) long, weighs 24,500 pounds (11,110 kilograms). Here is a photo of the launch of the Hubble Space Telescope below. It was launched on April 24, 1990, and entered service on May 20, 1990. It still remains in operation. Its estimated decay date is some year between 2030 and 2040. Compared to ground-based telescopes, it can take extremely high-resolution images. There are two main reasons for that: the telescope’s orbit is outside the distortion of Earth’s atmosphere and there is substantially lower background light up there. 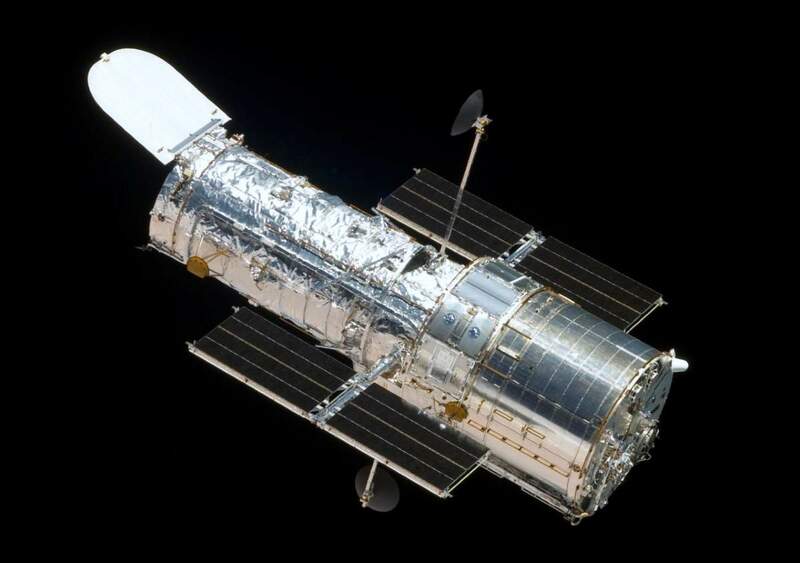 The Hubble Space Telescope was built by the United States space agency NASA, with contributions from the European Space Agency (ESA). The Space Telescope Science Institute (STScI) selects Hubble’s targets and processes the resulting data, while the Goddard Space Flight Center (GSFC, named in recognition of American rocket propulsion pioneer Dr. Robert H. Goddard, October 5, 1882 – August 10, 1945) controls the spacecraft. The Hubble Space Telescope is named in honor of astronomer Edwin Hubble (November 20, 1889 – September 28, 1953), who played a crucial role in establishing the fields of extragalactic astronomy and observational cosmology and is regarded as one of the most important astronomers of all time. He discovered that many objects previously thought to be clouds of dust and gas and classified as “nebulae” were actually galaxies beyond the Milky Way. He also provided evidence that the recessional velocity of a galaxy increases with its distance from the Earth (it had been both proposed and demonstrated observationally two years earlier by the Belgian Astronomer Georges Lemaître, though). 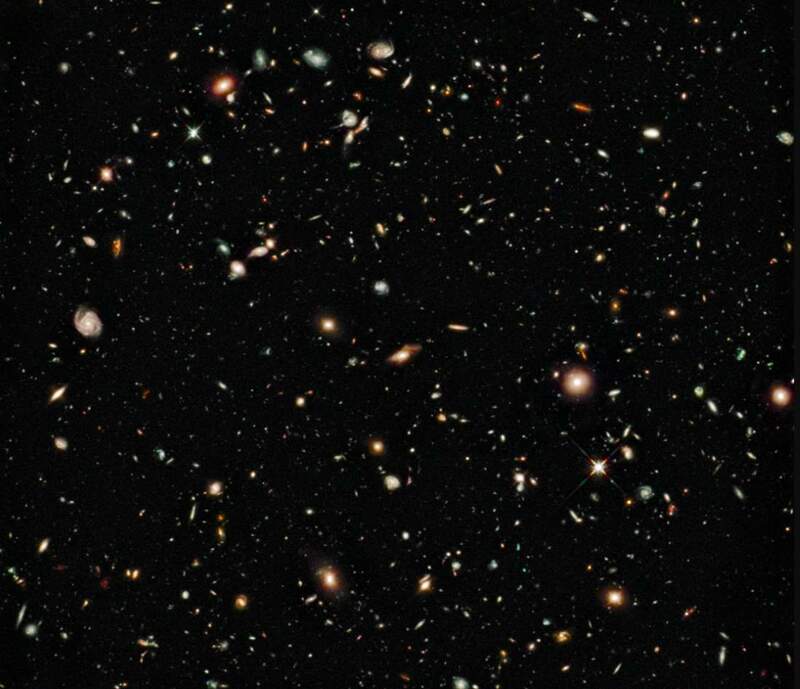 This is a property now known as “Hubble’s law”, which implies that the universe is expanding. The “expanding universe” provided the foundation for the Big Bang theory. It completes one orbit around Earth around 95 minutes at a speed of approx. 17,000 mph (27,300 km/h). It is not the first space telescope. That title goes to the Orbiting Astronomical Observatory 2 (OAO-2, nicknamed Stargazer), which was launched on December 7, 1968, and remained operational until January 1973. Hubble Space Telescope transmits about 140 gigabits of raw science data every week. Its energy source is the Sun: two 25-feet (7.62 meters) solar panels generate about 5,500 watts in sunlight. Its average power usage is ~2,100 watts. In order to take images of distant, faint objects, Hubble must be extremely steady and accurate. The telescope is able to lock onto a target without deviating more than 7/1000th of an arcsecond, or about the width of a human hair seen at a distance of 1 mile. It has two mirrors: Primary Mirror, 94.5 in (2.4 m) in diameter and weighs 1,825 lb (828 kg) and Secondary Mirror, 12 in (0.3 m) in diameter and weighs 27.4 lb (12.3 kg). It is nearly the size of a large school bus. But it can fit inside a space shuttle cargo bay. Hubble has made more than 1.3 million observations since its mission began in 1990. Astronomers using Hubble data have published more than 15,000 scientific papers, making it one of the most productive scientific instruments ever built. Those papers have been cited in other papers 738,000 times. Hubble generates about 10 terabytes of new data per year. The total archive is currently over 150 TB in size. Within weeks of the launch of the telescope, the returned images indicated a serious problem with the optical system. Although the first images appeared to be sharper than those of ground-based telescopes, Hubble failed to achieve a final sharp focus and the best image quality obtained was drastically lower than expected. Analysis of the flawed images showed that the cause of the problem was that the primary mirror had been polished to the wrong shape. Although it was probably the most precisely figured optical mirror ever made, the situation was catastrophic, introducing severe spherical aberration, a flaw in which light reflecting off the edge of a mirror focuses on a different point from the light reflecting off its center. While Kodak had ground a backup mirror for Hubble, it would have been impossible to replace the mirror in orbit, and too expensive and time-consuming to bring the telescope back to Earth for a refit. Instead, the fact that the mirror had been ground so precisely to the wrong shape led to the design of new optical components with exactly the same error but in the opposite sense, to be added to the telescope at the servicing mission, effectively acting as “spectacles” to correct the spherical aberration. The Hubble Space Telescope as seen from the departing Space Shuttle Atlantis, flying Servicing Mission 4 (STS-125), the fifth and final Hubble mission. Year of the photo: 1999. Source: NASA.gov The Hubble Space Telescope is one of NASA’s Great Observatories, along with the Compton Gamma Ray Observatory, the Chandra X-ray Observatory, and the Spitzer Space Telescope.